Lorraine, Part 1 (19 min) Video created, edited & complied by Imamess, part of the series "Alan Shore: The Women in His Life"
Lorraine, Part 2 (20 min) Video created, edited & complied by Imamess, part of the series "Alan Shore: The Women in His Life". For the rest of the series, watch "Melissa" and "Tara" here and "Ellenor", "Sally", "Diane", "Sheila", "Tara", & "Hannah" here. Bill Shatner on "Live with Regis and Kelly" (10 min) Watch Bill and Reeg on the balcony! Play Next on Boston Legal: Series Finale - Made in China & Last Call (:30) "We picked a really bad week to get married." Musical Tribute to Boston Legal Seasons 1-5 (3:30) created by the fab ADA. A must see! Music: Matchbox Twenty. 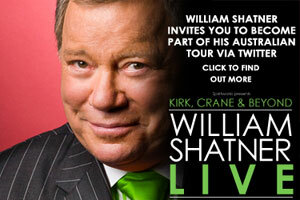 [April 4, 2011] Website WilliamShatner.com announced today that William Shatner�s 4-city tour of Australia entitled �Kirk, Crane and Beyond: William Shatner Live� has added a live interactive component to the tour to allow fans worldwide to participate and become a part of the show. Fans from around the world are invited to Tweet in a question during a specified time frame each night of the tour to William Shatner�s Official Twitter account. During a segment of the evening Mr. Shatner will go live online to Twitter and choose questions that have been tweeted in by fans during that day and answer them live on stage. The segment will be filmed and will be available at a later date on �The Shatner Project�; Mr. Shatner�s online video project which can be found on YouTube.com/WilliamShatner. Mr. Shatner�s Official Twitter account can be found at Twitter.com/WilliamShatner and he invites all William Shatner fans around the world to follow him on Twitter. Order, order! 'Boston Legal' is now in session on TV Land! The Primetime Emmy Award-winning hit series created by David E. Kelley premieres on Monday, February 15th with a President's Day marathon from 12pm - 12am EST/PST, showing the best cases, most outrageous moments and most creative storylines that audiences love. During the marathon, TV Land PRIME will offer special character "briefs" on viewers favorite Crane, Poole & Schmidt firm members such as Denny Crane, Alan Shore and Shirley Schmidt, and viewers will learn personal and professional information on the characters as well as everything they need to know about this popular series. 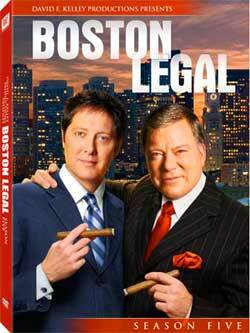 Boston Legal Season 5 DVD Due May 5! "Boston Legal - Season 5" is making its DVD debut on May 5th. This 4-disc set contains the final 13 episodes which include extras like "Denny's Daughter: The Untold Story" and Stricken from the Record! (Deleted Scenes). Price will be $49.98 in the US. You can pre-order at Amazon and - at the moment - it is 30% off. By using this link, Amazon will give a percentage of the sale to this site. Thank you! Share your thoughts about Boston Legal. Golden Throat of Shatner and way more.